During the fallout of Studio Ghibli's 2014 hiatus, film producer Yoshiaki Nishimura founded Studio Ponoc the following year. 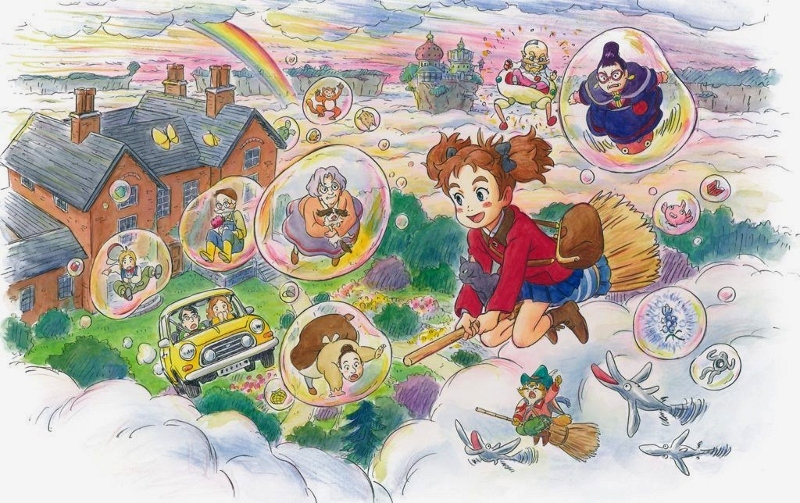 Among the deep roster of Ghibli talent that came with him was artist-turned-director Hiromasa Yonebayashi, who began his career animating such classics as Princess Mononoke, Spirited Away, and Ponyo before teaming with Nishimura on his second directorial effort, When Marnie Was There. 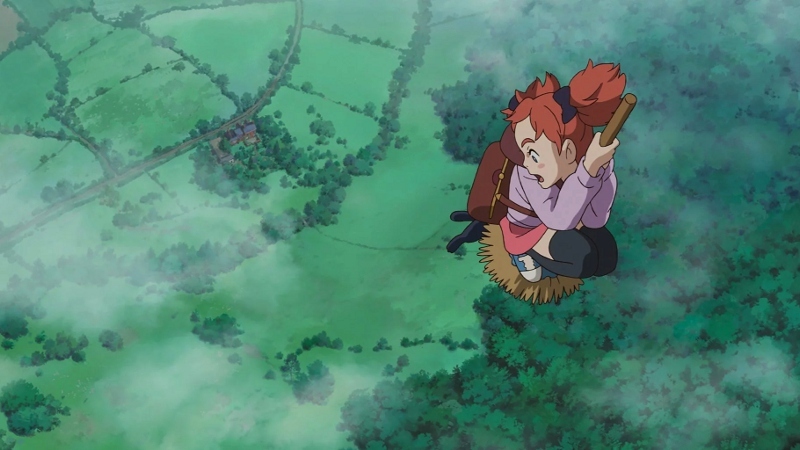 Yonebayashi proved to be a natural fit for the fledgling studio's first film Mary and the Witch's Flower, an adaptation of Mary Stewart's 1971 children's novel The Little Broomstick. Lightweight and entertaining during its breezy 103-minute lifespan, Mary and the Witch's Flower follows young Mary Smith across (and occasionally above) the pastoral British countryside. A stubborn, clumsy, and well-meaning young lady, wild-haired Mary is staying temporarily with her great aunt Charlotte; her environment may look idyllic, but the young girl seems uncomfortable in her own skin. After running an errand into town on a misty morning, Mary follows what might be a magical cat into the surrounding forest ahead of Peter, a local boy, where she discovers a glowing purple plant near an abandoned broomstick with strange carvings on the handle. Soon enough, Mary is whisked into the clouds and ends up at mystical Endor college, where she's found to be in command of strong magical powers. Although she's excited to finally be great at something, Mary's newfound ability might just be due to her glowing purple discovery. My only two complaints? 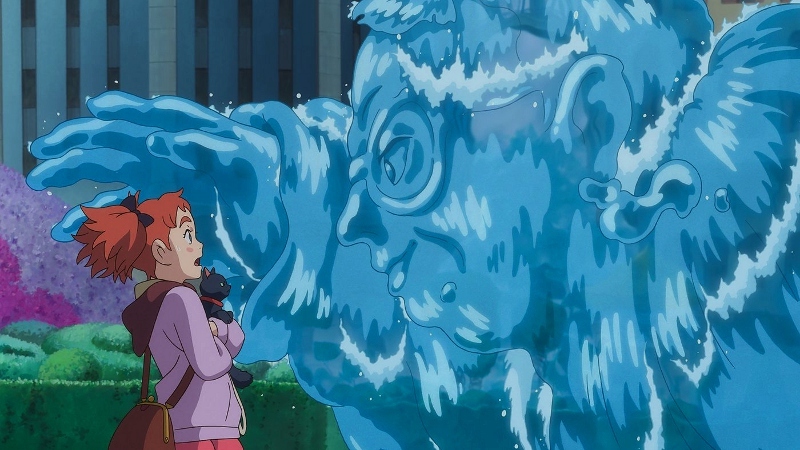 For starters, Mary and the Witch's Flower can't help but borrow liberally from Studio Ghibli's deep catalog of fantasy films -- from visual designs to music and character elements, there's a certain "sameness" here that might irk fans looking for something a little different. It's not surprising, given the careers of key creative team members, nor is it completely off-putting this early in the studio's lifespan. In fact, the familiarity here might even work to the film's advantage -- but in my mind, it's neither a tonal advantage nor a complete turn-off. What did slightly bother me, on the other hand, is the film's lack of commitment to its "villains" (if you can call them that); without revealing any major spoilers, two characters flip-flop from friends to adversaries and back much too quickly, which feels more like a convenient roadblock than an organic part of the story. 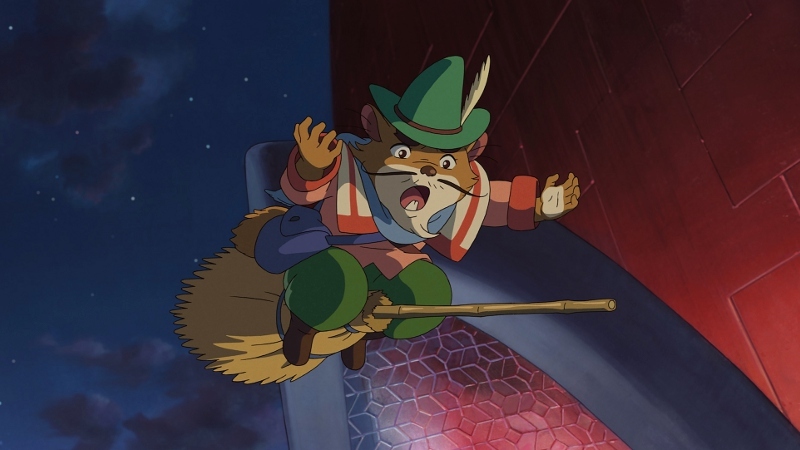 Ghibli films have become known for favoring internal conflicts over tradition villains, and it's almost like the screenwriters couldn't decide which path to stay on here. In any case, the good far outweighs the bad here -- so whether you're flying blind into this one or have been eager to see it for years, GKIDS' new Blu-ray/DVD combo pack proves to be a great package. The A/V presentation is flat-out flawless, which certainly sells Mary and the Witch's Flower's outstanding visual design, capable voice acting (in both English and Japanese), and enveloping audio mix. What's more is that the bonus features are very well-rounded considering its limited theatrical release, which should please anyone accustomed to importing Blu-rays just to get a good version. Without question, this recent animated film looks flat-out flawless on Blu-ray: GKIDS obviously had a great 1080p transfer from Universal to work worth, which has been translated seamlessly to disc with no apparent issues. Mary and the Witch's Flower has a beautiful style with great designs, painterly backgrounds, and interesting visual flourishes that grab the viewer's attention from start to finish. Image detail, texture, and color reproduction are all quite stunning at times, with relatively deep black levels and strong contrast that creates a nice illusion of depth. No obvious digital imperfections -- including animation regulars like banding, compression artifacts, or jagged edges -- could be spotted along the way, rounding out the visual presentation nicely. Overall, it's a great-looking film that we're lucky to have: this one only earned a limited domestic theatrical release back in January, so it's good to have a nice copy on disc so quickly. Like most anime titles, viewers can choose between the original language Japanese 5.1 track or an English 5.1 dub in lossless DTS-HD Master Audio. Both offer an outstanding and deeply atmospheric mix with crisp dialogue, solid channel separation, plenty of rumbling LFE, strong, panning effects, and no shortage of subtle touches along the way. Naturally, the most enveloping moments occur during Mary and the Witch's Flower's more magic-driven scenes, while the original score by Takatsugu Muramatsu (Lu Over the Wall, When Marnie was There) also carries a great deal of weight without overpowering the dialogue. Either way, there's no room for complaints here: Mary and the Witch's Flower sounds just as good as it looks. GKIDS' Blu-ray thankfully includes subtitle options for both the Japanese track AND the English dub, as well as French subs for Canadian viewers. Good to see that this is slowly becoming the norm. GKIDS' menu interface is smooth and simple, offering separate options for audio/subtitle setup, chapter selection, and extras, with no annoying trailers beforehand and a handy "Resume" function. This two-disc release arrives in a dual-hubbed keepcase with attractive two-sided artwork, a matching slipcover, and a Digital Copy redemption slip. Several items of interest are included, and a few are surprisingly thorough. NTV Special: "Creating Mary and The Witch's Flower" (38:49) looks at the film's 500-day production schedule from inception through its theatrical release; hosted by lead voice actress Hana Sugisaki, it also features other members of the Japanese voice cast, the director, and other key participants. "A Special Conversation with Sekai No Owari" (31:34) sits down with band members Saori, Fukase, DJ Love, and Nakajin who, along with director Hiromasa Yonebayashi and producer Yoshiaki Nishimura, talk about the birth of the film's theme song, which marked the director's first use of a Japanese group for such a task. A few less in-depth but still worthwhile extras are here as well. Interview with the Filmmakers (13:49) pairs up the director and producer again, who talk about establishing Studio Ponoc and developing the film. Film Completion Press Conference (14:18) includes scenes from an outdoor promotional event featuring the director, producer, and six main members of the Japanese voice cast. A Theatrical Promotional Movie (10:46), introduced by lead voice actors Hana "Mary" Sugisaki and Ryunosuke "Peter" Kamiki, serves as a clip-heavy, condensed overview of the film's production. Finally, an exhaustive collection of Japanese and American Trailers & TV Spots (21 clips, 15:26 total) rounds out the package. Strongly animated with rich visuals, Hiromasa Yonebayashi's Mary and the Witch's Flower is a wonderfully entertaining debut from Japan's Studio Ponoc. Since several members of its key creative team (including the director himself) have deep roots in Studio Ghibli, it can't help but borrow a lot of atmosphere and feeling from at least a half-dozen Miyazaki films like Princess Mononoke, Kiki's Delivery Service, and Howl's Moving Castle -- but that's completely understandable and hardly a cause for concern, especially this early in the studio's life. GKIDS' treatment of Mary and the Witch's Flower on Blu-ray is as great as expected, featuring a top-notch A/V presentation and an assortment of general but well-rounded bonus features. Established fans and curious newcomers alike should consider this one Recommended.